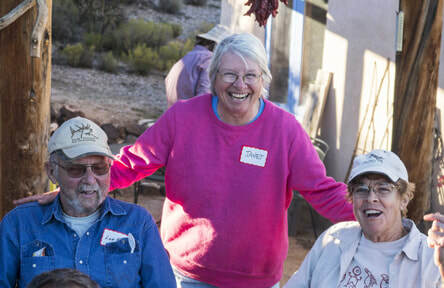 Many of the 100 volunteers who give time to MPPP gathered October 29 at Katherine's Wells home to socialize, meet other volunteers, enjoy fantastic food and drink and participate in tours on the Wells Petroglyph Preserve. The event is sponsored by the MPPP Board of Directors and staff members in appreciation for the thousands of hours and miles driven by volunteers in behalf of the project. Alec Kercsó, Board President, introduced board members and MP staff present at the event. 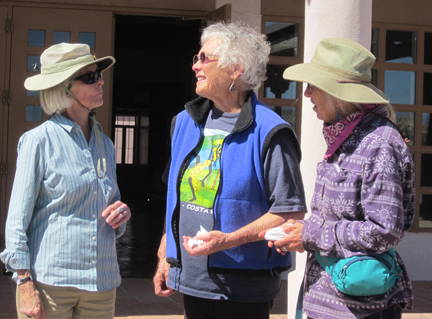 A brief overview of the various fund raising events was summarized including the Annual Flute Player Tour held last weekend at the Wells Petroglyph Preserve. Guest of Honor Paul Williams traveled from Albuquerque to gather with friends at Mesa Prieta. 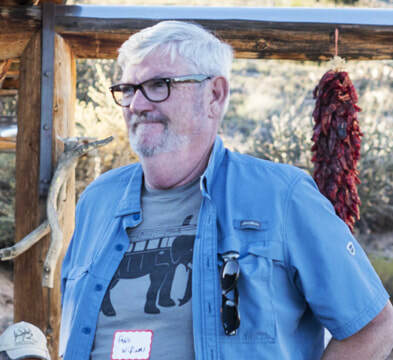 Retired Taos Archeologist, Paul met Katherine when she first purchased her property and was instrumental in initiating recording on her land as well as participating in the startup of the Annual Summer Youth Intern Program. He is one of the Project's staunchest supporters! MPPP Volunteer Coordinator Gretchen Yost arranges the various dishes prepared by MP board members, staff and others in the alcove by Katherine's home. Gretchen makes the first contact with new project volunteers and, with Janet, holds Volunteer Orientation sessions every other month to provide an overview for the many volunteer options. Her energy is unsurpassed! A highlight of the picnic was the presentation of awards to outstanding volunteers by Project Founder Katherine Wells and Volunteer Coordinator Gretchen Yost. Each person received a certificate and a goodie bag filled with treats including a small rock with a petroglyph drawn on it by founder, Katherine Wells as well as the new 2018 calendars photographed by Board Member Norman Doggett. 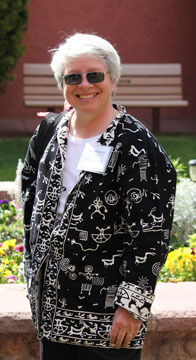 Alison Youngs received an award for several years of dedicated work in many areas. She helps prepare for the Summer Youth Intern Program and is an adult leader in the field with the interns for two weeks every year which is nothing short of heroic! Alison spends many hours helping to prepare for fundraising events, makes herself available for any task and is also a petroglyph recorder. Sandra Romero signs up to be a tour guide for almost any tour. She is one of the most dependable docents we have ever had. 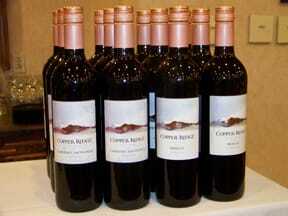 In addition she helps with event preparation and at events doing whatever job is needed. She never brings attention to herself but if you look around at any event you'll probably see Sandra quietly doing a task with great competence. Cathy Benthagen received an award for being an outstanding and engaging docent who seems to give a tour nearly every day. She is very knowledgeable and relates with ease to visitors to the Wells Petroglyph Preserve. Her flair and vivacity make her a standout. She also helps with events and has a great can-do attitude. Cathy also is a petroglyph recorder. Russell Martenson received his award for leading more tours than any other volunteer docent with MPPP. Russ also is a petroglyph recorder and assists with set up for events such as Pláticas. Candie Borduin, one of MPPP's founders and Petroglyph Recording Coordinator and Trainer received an award for the massive amount of work she does annually including recorder training, technical processing, managing the MPPP website, tasks in conjunction with Janet and others regarding our database and others jobs needed to keep our recording mission on track. She received a certificate and a calendar. Ribs a la Mark MacKenzie, salads, desserts and beverages were served. Volunteers, board members, MP staff and guests spent time getting acquainted, visiting and catching up. The warm afternoon was appreciated as were the golden cottonwoods in the bosque below. Board Secretary Norman Doggett and Project Administrator Jennifer Goyette provided photographs for the event. Long time volunteers Mary Orr and Esta Gutierrez enjoy visiting with other volunteers. Mary is a Site Steward who monitors a sensitive area of the Wells Petroglyph Preserve. Esta is the project Outreach and Education Coordinator for the 4th-7th grade curriculum "Discovering Mesa Prieta", a stem based curriculum presented in over 20 local schools. Lynn Cravens and Scott Potter enjoy the food offerings at the picnic. Lynn and Scott are petroglyph recorders who work regularly on Mesa Prieta. They also offer extra hands when needed for project activities. Volunteers Lee and Candie Borduin share a laugh with Project Director Janet MacKenzie. 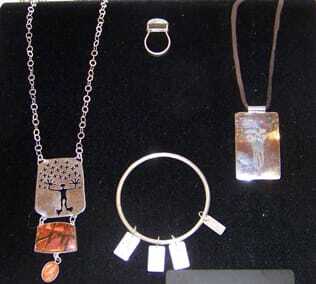 Archaeological Society of New Mexico Recognizes MPPP Volunteers! At the May, 2017 Archaeological Society of New Mexico (ASNM) Conference held in Moriarty, MPPP Founder Katherine Wells and Recording Coordinator Candie Borduin were both recognized for their work with MPPP. recording images in the 1980's and 1990's. work has been instrumental in recording over 50,000 petroglyphs and in the design of a GIS linked data base that contains the recorded rock art on the mesa." 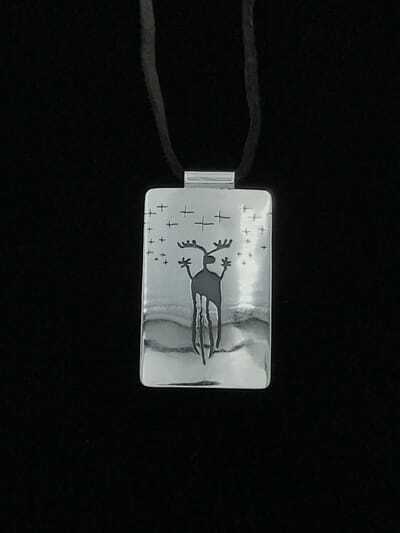 Hotel Santa Fe; the Mesa Prieta Petroglyph Project Board of Directors members, staff and volunteers presented the first MPPP Annual Silent Auction that was a tremendous success! 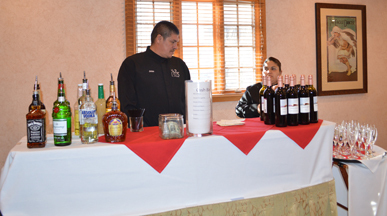 Travel trips, over 60 donated items including jewelry, photography and paintings, gift certificates, art creations, certificates for local B&Bs and other intriguing items drew close to a hundred bidders to vie for the auction items. MPPP Founder Katherine Wells gave door prizes throughout the evening. The Fletcher and John Trio provided music throughout the event. 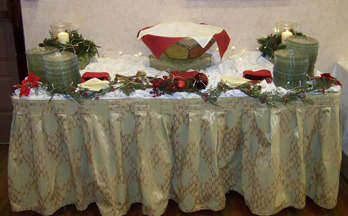 Cash bars, appetizers and a buffet were featured. 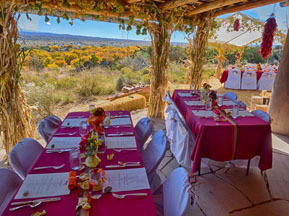 Mesa Prieta - The Wells Petroglyph Preserve - autumn - golden cottonwood trees in the Rio Grande Bosque - a beautiful New Mexico sky with picturesque clouds floating about - amazing petroglyphs - incredible food! The 2017 Flute Player Tour was all of that and more. Archaeologists intimately knowledgeable about the Preserve led twenty-five guests to view twenty-five flute player images. The Northern Rio Grande National Heritage Area Heritage Center in Alcalde, formerly the Oñate Center, was the setting for the Annual Mesa Prieta Volunteer Appreciation Picnic in September. A wonderful pot luck, door prizes, project updates and rare opportunities to visit with other volunteers filled the afternoon. Several volunteers were recognized by Mesa Prieta leaders for exemplary contributions to the project. tracking volunteer hours and contributing as needed. She trained as a docent and for the last several years has handled the merchandise table at the end of tours as well as at special events. Jan joined the MPPP Board of Directors in 2014 and serves as a member at large and became a member of the Development Committee this summer. Congratulations Jan! 2016 Mesa Prieta Volunteer of the Year! 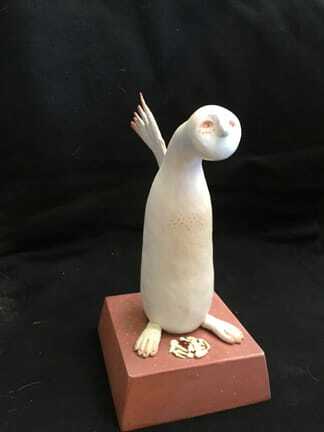 Esta Gutierrez and Judith Chaddick, both major contributors to the Mesa Prieta Petroglyph Project 4th - 7th Grade Curriculum, were recognized for their continuing dedication to introducing the curriculum to Northern New Mexico Schools. The most recent Teacher Training in September, 2016 had eighteen attendees from area schools including eight from Ohkay Owingeh. Click here for MORE about 2016 Volunteer Awards. 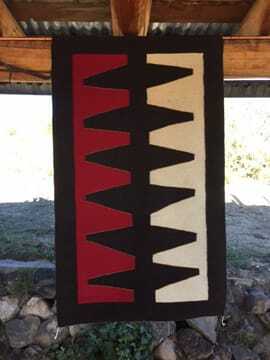 In addition to her work with Mesa Prieta she also runs her own small textile business as Tiny Odd Bird. Jennifer and husband Brian live in Dixon with their dog Loki. 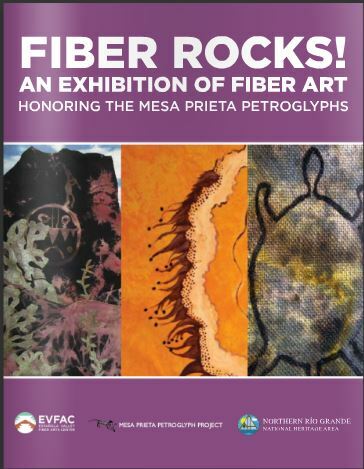 We are happy to announce that a beautiful show catalog from the Espanola Valley Fiber Arts Center (EVFAC) and Mesa Prieta Petroglyph Preserve exhibition 'Fiber Rocks!' 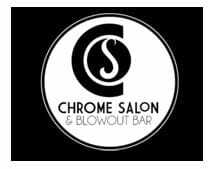 is now available online! View the beautiful fiber art from the show for the first time, or revisit your favorite pieces and artists. If you're interested in a print copy of this catalog, contact the EVFAC store. MPPP featured in New Mexico Magazine! The May, 2016 issue of New Mexico Magazine featured Katherine Wells and the Wells Petroglyph Preserve. "Katherine Wells - the Discovery of a Lifetime" tells the story of how Katherine came to purchase and live on what was to become the Wells Preserve. Her efforts in preservation are featured with the many successes experienced through the Mesa Prieta Petroglyph Project. The Wells Petroglyph Preserve is the only area on massive Mesa Prieta open to the public for visitation. About 100 docent-led tours are given annually, leading over 1000 guests on six established trails on the Preserve. Terrain Management on the Preserve is a very high priority for MPPP leaders. 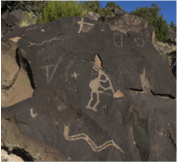 Annual Terrain Management days are held in the fall and spring to stabilize the trails and terrain, providing protection for the petroglyphs and visitors alike. All material used in Terrain Management on the Preserve are supplied by The Archaeological Conservancy, owner of the Preserve. MPPP volunteers supply the man and women power including dozens of hours of work, tools and expertise. 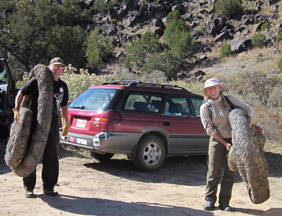 Russ Martenson and Sarah Manges carry wattles up the steep tour trail to be used in stabilizing erosive channels. Other materials used include straw bales and stakes to stabilize both the bales and wattles. Dan Gonzales, Ron Klinger, Carl Calvert, Russ Martenson and Mark Sharrock take a break. Volunteers cleared trails, built steps for both safety and to reduce erosion and stabilized boulders on one of the Preserve's trails. Project Director Janet MacKenzie organized the work day; other volunteers who participated include Dana Atkins, Jim Pagel and Kathleen Broyles. On October 25, about 30 plus volunteers gathered at the Wells Petroglyph Preserve to train or renew training as Tour Docents on the Wells Preserve. The full day session included a great lunch provided by session organizers. Each participant received a portfolio rich with infomation to prepare them to become docents. 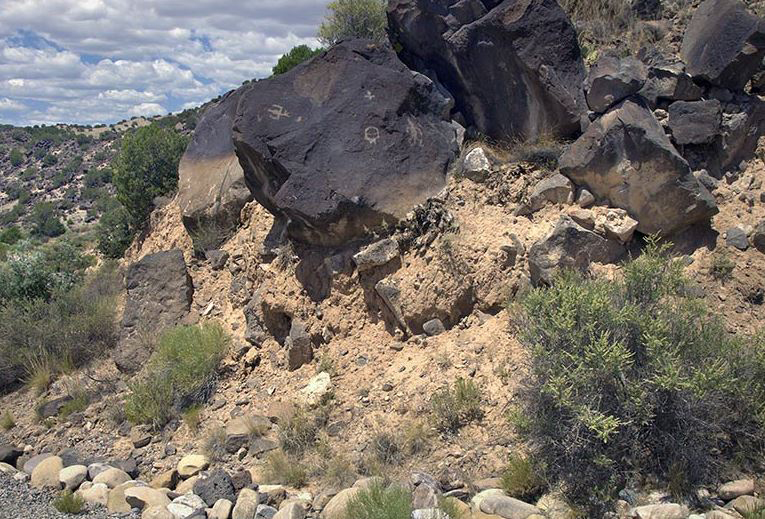 Docents are provided with comprehensive information about Mesa Prieta, MPPP, cultural history, time periods represented on Mesa Prieta, how petroglyphs are made, geology and of course, the petroglyphs viewed on the six established trails on the Preserve. Project Founder Katherine Wells and Project Director Janet MacKenzie led the docents through information to share with guests on the Preserve and led spirited conversations about experiences as Tour Docents. 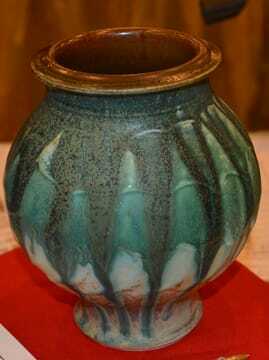 Trainers emphasized respect for the images and the people and cultures who made them. 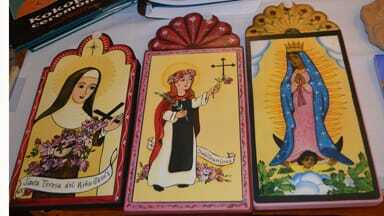 Their origins and meanings are unknown. Volunteers were then led on a brief one hour tour to introduce them to the Preserve and how tours are conducted. Scheduled tours on the Preserve last about two and one half hours. Docents are requested to lead six tours in a one year time period. New docents are encouraged to "tag-along" with experienced docents to learn the trails, techniques of leading a tour as well as information shared about the images. Tour guidelines are provided for each of the six tours that include comprehensive discussions about the images as well as a snapshot of each image highlighted. 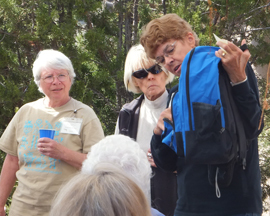 About 15 docents led four or more tours thus far in 2015 and were recognized with a MPPP backpack. Three of these docents led 15 or more tours including Janet MacKenzie, Carl Calvert and Katherine herself who led 44 tours (she received only one backpack)! Above right: Janet MacKenzie, MP Project Director, Founder Katherine Wells and Petroglyph Recording Coordinator, Candie Borduin exhibiting the snazzy new backpacks monogramed with the MPPP logo that were given to experienced docents. Have an interest in training to become a docent? At the recent annual Heritage Preservation Award Ceremony, our Project Director, Janet MacKenzie received a Heritage Preservation Award from the Department of Cultural Affairs, Historic Preservation Division, Cultural Properties Review Committee. Janet was recognized for her work at MPPP both as a volunteer and in a leadership position. 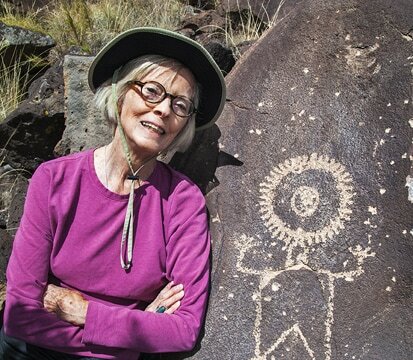 Her award is in the category of Archaeological Heritage for "elevating the archaeological significance of the Wells Petroglyph Preserve and efforts to move Mesa Prieta into national heritage protective status." Held May 8, 2015 at the Scottish Rite Center in Santa Fe, the Heritage Preservation Awards Ceremony is an annual celebration of people who have made significant contributions to heritage preservation. The event is part of Heritage Preservation Month. Award categories include: Lifetime Achievement, Archaeological Heritage, Individual Achievement, Citizen Advocacy, Heritage Organization, Architectural Heritage, Heritage Publication and Distinguished Lifetime Achievement. Twenty four awards were given in 2015. John Guth, MPPP Board member, was recognized for a second year in a row with an Heritage Preservation Award. John along with Harriet Rosenstein and John Richardson, were recognized for "volunteering to archive thousands of historical records for HPD-ARMS." John is an active member of the MPPP Technical Processes Committee; he is a significant contributor to the management of MPPP data. conditions and erosion at the site. Katherine Wells named one of "Ten Who Made A Difference"